Thus far, I have shared with you Christmas hymns such as: Hymn of the Day: Joy to the World, Hymn of the Day: O Come, O Come, Emmanuel, Hymn of the Day: Let All Mortal Flesh Keep Silence, and Hymn of the Day: O Holy Night (Hear the Gospel Story). Today, I want to share another favorite Christmas hymn for most people, Angels We Have Heard on High. This hymn is a traditional French carol, but that is about all we know of this hymn’s origins. What we do know is the text that this hymn is based on. In Luke 2:8–21, we are given a glimpse into a magnificent part of history surrounding the birth of Christ. It’s a simply beautiful image: the shepherds in a great field, staring up in wonder at a sky full of the heavenly hosts, singing out their praise and joy, the echoes of their song of reverberating off the mountains to add to the cacophony. It isn’t hard to imagine the shepherds’ response. This group of young boys must have looked at each other wide-eyed, then whooped and cheered and run as fast as they could into the village, a stampede of sheep following them. Giddy with excitement and out of breath, did they burst into the stable and crowd around the manger? Or did they stop at the stable door, suddenly shy and overwhelmed, and peek in at the couple holding a tiny baby? Did they fully understand what they were witnessing? Do we even fully understand what they were witnessing? 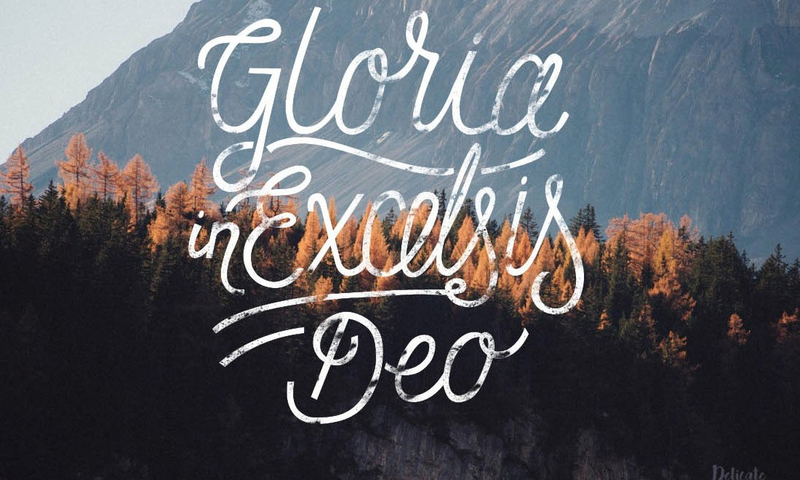 This hymn invites us to “Come to Bethlehem and see.” Today, we go to Bethlehem. We peak through the stable doors, and we kneel in amazement before the Christ child, our ears still ringing from the angels’ song. More so than the shepherds, we are able to see who this child is, because we know the Gospel story. We know that the angels would come again, this time to announce that Christ was not where the women looked for Him, but that He had risen. It isn’t hard to imagine that a “Gloria” would have been on those angels’ lips as well. The chorus of this great Christmas hymn is based on the Latin Vulgate translation of Luke 2:14, the message from the multitude of heavenly host praising God. If you haven’t ever heard of Andrea Bocelli, you need to. I have listened to him sing for most of my life and each time I listen to this man sing it brings me close to tears. Although he is blind, he sings as though he sees God! And even though he sings in another language, it is still breathtaking! Here are the Piano Guys having fun with this hymn. It is amazing what they can do with just one piano and four guys! And as always, the sheet music! Wow! Both were beautiful and goes along with my post’s theme today of worship. I am enjoying these selections. Thanks.